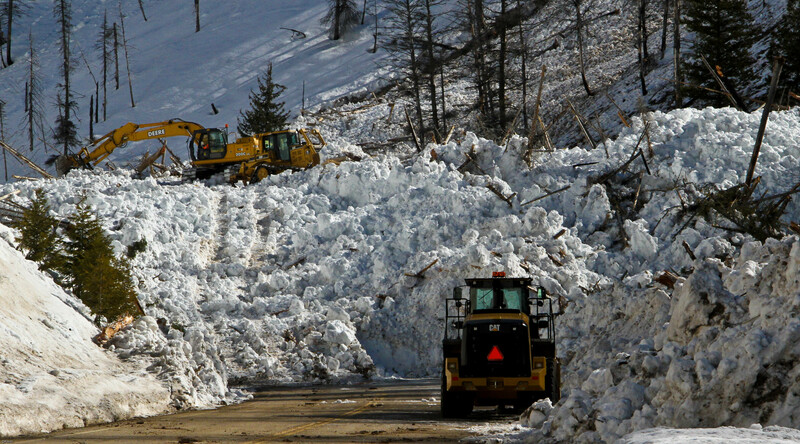 Avalanche in March 2014 which took 10 days to clean up. At some point or another, we’ve all had our travel plans affected by road closures due to avalanche concerns. Within the Boise forecast area, those slated with making these decisions work for the Idaho Department of Transportation (ITD) Avalanche Center in Lowman, Idaho. The National Weather Service works closely with this office, providing up to date weather conditions for three locations highly susceptible to large natural avalanches (versus human-triggered avalanches). We thought it would be fun to meet and greet the two permanent Avalanche Center employees, Bill Nicholson and Chantel Astorga, for some hands-on training in how their operations are conducted. NWS forecasters Jay Breidenbach (green), Elizabeth Padian (red), Korri Anderson (grey), and Aviva Braun (green) gather for a photo with ITD Avalanche employees Bill Nicholson (Blue) and Chantel Astorga (Pink). 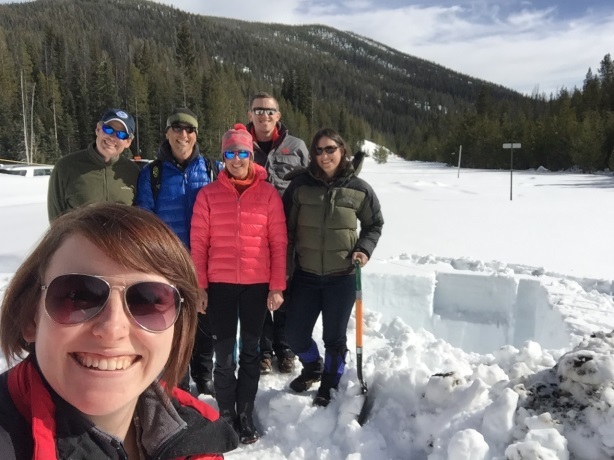 Excitement was high after digging a snow pit on February 26th as part of the monthly snowpack evaluation process. NWS: Good morning! Could you introduce your office to our readers? Avalanche: Good morning! Well, our program began about 8 years ago after realizing the need for avalanche forecasters for Highway 21, in the Boise forecast area, and Highway 12, in the Missoula forecast area. These roads had been hit by avalanches before and had put many, including the ITD maintenance staff, in danger. We now provide avalanche susceptibility ratings to the ITD staff and close down roads when avalanche dangers are high. Both of us come from ski patrol backgrounds and have a lot of experience with avalanches and understand their dynamics greatly. NWS: How do you maintain situational awareness of current avalanche conditions? Avalanche: We go out into the mountains (on our skis!) to evaluate the strength of the snowpack every day! We are skiers at heart for sure. Because we are out there every day, we have an idea of how much stress the snowpack can take. We always go in pairs for safety’s sake. When conditions become critical, we go out in our trucks. Those are the days we are on the phone with your office the most! NWS: What weather phenomena have the greatest impacts on avalanche conditions? Avalanche: The biggest impacts to avalanche conditions are heat – the first warm day after we’ve been having precipitation is a really big stress, the first prolonged thaw– beginning at the start of that melting period until the water has made it all the way down to the bottom of the snowpack, and finally, during big precipitation events. In very general terms, big precipitation events are when we have more than an inch of water weight (as snow) – that’s when we have to do something. An inch of water weight as rain is a really big problem! But that’s rare here, luckily. The days we call your office frequently are when the rain-snow line is at a level that we’re not quite comfortable with. If the snow level stays at 5500 feet, we’re okay, but if it goes to 5800 feet that would really cause some issues. Another factor that can greatly influence avalanche danger is wind, but in this area, we rarely get wind-driven avalanches. Every canyon has its own personality; we have gotten to know and understand this canyon pretty well, therefore, we can predict how it’ll behave with each incoming storm. NWS: How many avalanches do we average per year here on Highway 21? Avalanche: We average 30 to 40 avalanches per year, and these are the large, destructive kinds. We’ll have days where just everything goes. On those days, the highway is closed. NWS: How does the NWS help your office achieve its goals? Avalanche: In 2000, one of the foremost scientists based out of the avalanche center in Calgary, Canada, estimated that with an aggressive avalanche program, the number of road closures could be limited to 30 days per year. Our current average is 15 days! Every day, NWS provides forecasts for us so that we can be up to date and ready for incoming changes to the weather – whether it is warmth, rain, or snow. Without your forecasts, the roads would be closed all of the time! When we do decide to close the road, we try to give people at least 8 hours warning. You guys make that possible because we’ll see the next system coming in your forecasts. However, there are outliers to the 15-day road closure average. For example, two years ago in March 2014, we had that massive avalanche cycle that took 10 days to clean up! NWS: How does your team conduct its monthly snowpack stress tests? Avalanche: Once a month, we do an evaluation of the snowpack within the same location at Banner Summit (7200 feet). We do this to see where the snowpack layers are located. As you know, without layers, there would be no avalanche danger. We dig a (new) pit in the snow each month with a smooth wall in which we can pick out the layers. When we think the snowpack is weak, we dig many pits to evaluate the spatial variability. Within the pit, we take the temperature every 10 cm to see if there is a gradient since that gradient drives changes in the snow. A temperature gradient increases the snowpack weakness; without a temperature gradient, the snowpack is stronger. Another test we do is a hand hardness test which relates directly to strength. However, we try to evaluate the snowpack in a general sense and not get too caught up in the specifics of each layer because sometimes the specifics can just be distractions. The end goal is to evaluate whether the snowpack can handle 1 or 2 inches of water – what will its breaking point be?. The weight of precipitation is what stresses the foundation of the whole snowpack. During a big event, snow density can change rapidly. Snowpacks are a super dynamic system and change constantly, much like weather! The thing is, we begin keeping track of weather conditions in detail November 1st, so if we are doing our job correctly, we aren’t going into the pit to discover the snowpack details – we are going into the snow pit to verify what we already know. NWS: This has been super enlightening! Thank you for speaking with us. 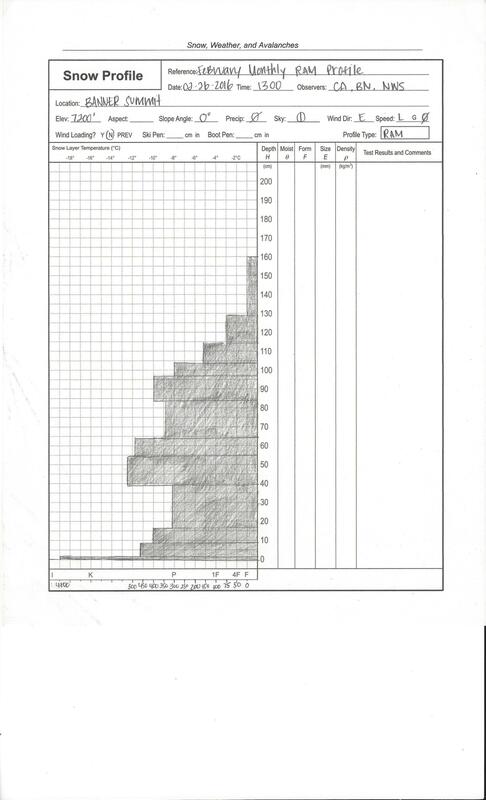 Snow Profile showing the snow layers and temperature versus snow depth. 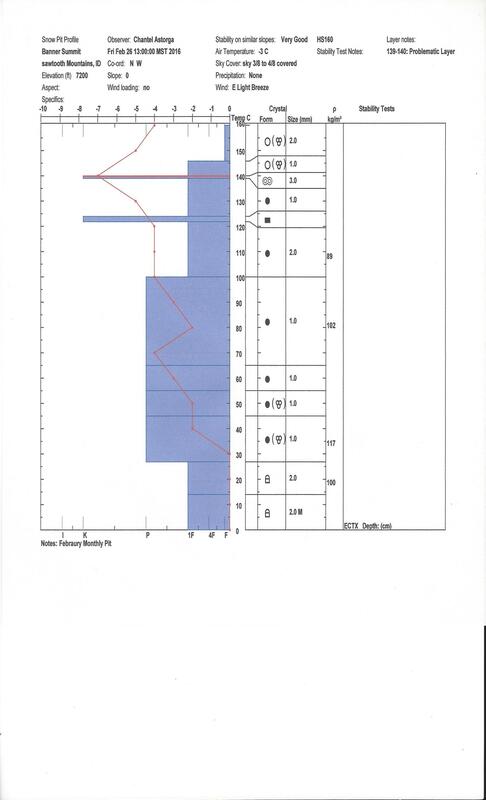 Monthly Snow Pit Profile showing snow showing snow crystals by depth and stability of snow by layer.